Are you in search of that one product that will lend authenticity to your employee orientation or brand building efforts? Look no further, above these custom sticky memo cubes! These memo cubes are ideal for businesses trying to strengthen their grip in the niche. Being offered in several shapes and sizes, you can easily find the one that perfectly highlights your brand information as well as finds footage over work desks of your prospects, clients or employees. By distributing these sticky paper cubes, rest assured that your brand logo is going to become their priority. 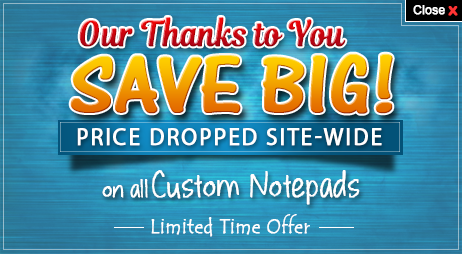 Free artwork & free online design proof, fast and secure shopping, shortest turnaround time are some of the benefits that you can expect when buying from NotepadsDirect.com. There is no shortage of opportunities when it comes to distributing these custom sticky memo cubes. These logo adhesive cubes can be distributed during tradeshows, office events or on any occasion. Most people find these custom sticky memo cubes attractive and they are more inclined to use them as writing pads, paperweights or a desktop decoration item. Investing in custom sticky memo cubes is one decision. Your brand will always be remembered with pride since everyone is going to treasure these sticky memos for a lifetime! These sticky pads are highly purposeful and popular with everyone. Their colorful design will encourage people to use them or carry them wherever they go. We offer a very comprehensive collection of high –quality logo adhesive cubes in several sizes, sheets, customization methods and colors. Choose the best and perfect item which suits your organization or company. These memo cubes are offered with 4 or 3 color side imprints and optional sheet imprint. Free 1-2 color sheet imprint, free 1-3 color side imprint and free 1-4 side designs are a few of the benefits offered for these sticky paper cubes. You can pick out the perfect sticky memo cube for your brand and get it customized the way you want it. The best part is your product will be used by recipients and it will deeply influence their buying decisions. You can offer these sticky pads as an individual token, complimentary token, corporate bag insert and a parting gift. Do you nurse high expectations from your logo imprinted adhesive paper cubes, feel free to approach us at 855-866-8372 or write to us at info@Notepadsdirect.com.